Q. I need an exit sign that runs only on batteries. Battery powered exit signs do not exist per 7.10.9.2 of the Life Safety Code. Any sign with a battery is required to have an electrical connection to maintain that battery in a state of readiness when the power goes out. 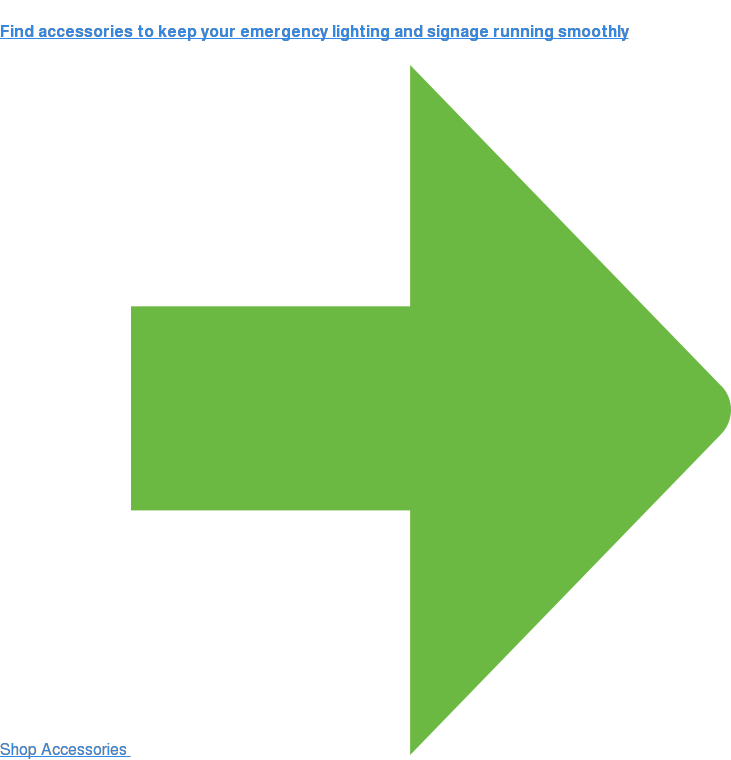 For exit signs that do not require any electricity the two options available are Self Luminous Tritium Exit Signs, and Photoluminescent Exit Signs. Q. What is a tritium sign? Tritium (H3) signs are non-electrical exit signs that operate independently from AC line voltage. They do not require any means of electrical input and will illuminate for a span of ten (10) or twenty (20) years depending on the model selected. These signs are the go-to solution for areas that do not have access to electricity because you can simply take them out of the box and hang them up like a picture. Installation is simple and can be done without an electrician since there is no wiring required. Q. What is a photoluminescent sign? A photoluminescent (PL) sign is a "glow in the dark" type of exit sign. They are like the glow in the dark stars that are often found in children's rooms on the ceiling. This technology requires ambient light to be present for it to charge. 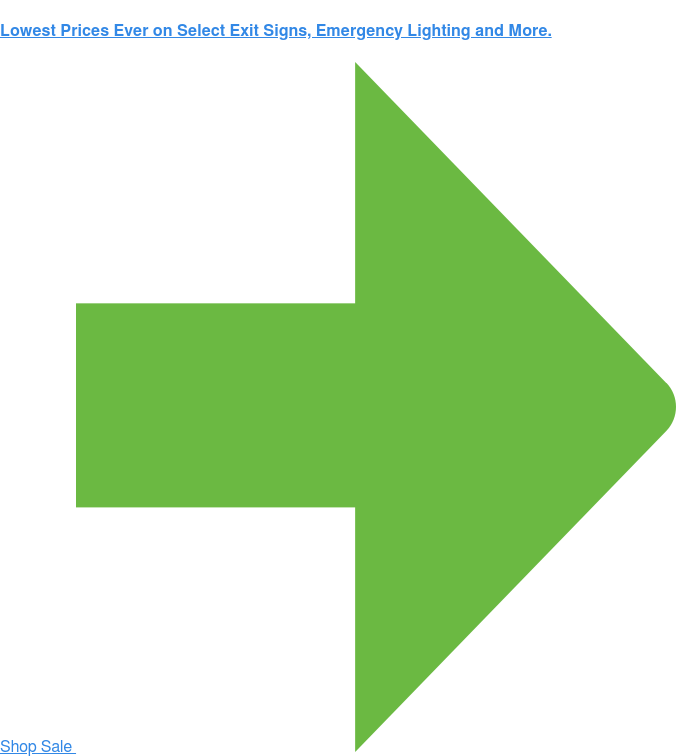 When the light is absent, the sign will then illuminate in green for a minimum of 90 minutes. The illumination has a diminishing return, as it glows for longer, the brightness will fade and once 90 minutes have passed, they will no longer be bright enough to meet emergency egress standards but will still glow. A minimum of 5 ft. candles from ambient lighting is required to be shining on the face of the sign in order for it to charge. Sunlight is not a proper source of energy for these signs as it is not constant. Q. How do exit signs get mounted? Typical installations of exit signs are either flush against the wall (back mount), off the wall like a flag (end mount), or hanging from the ceiling (top mount). Almost every exit sign that is mounted onto a surface will ship with the mounting bracket required for all three of these mounting options. This is commonly known as a "universal" mounting capability. Other installations include ceiling recessed or wall recessed mounting. These types of Installations require you to cut a hole out from the wall or ceiling and are most commonly used when the job is considered "new construction" where the drywall has not been put up yet. Q. How do I test my exit signs / emergency lights? Simply push the test button on the side of your sign / light and hold it down for 30 seconds. This test should be performed monthly or every four (4) to five (5) weeks. Q. My exit sign / emergency light is buzzing, why? This is commonly caused by a dead battery. Simply push the test button, if the sign or lights do not flicker for a moment then come back on as the button is being pressed, then your battery is most likely faulty and needs to be replaced. To diagnose this, take the battery from another existing unit and put it into the buzzing Unit. If the buzzing stops then the issue is a bad battery, otherwise, please refer to the installation manual that came with your fixture. There is often times a chart that will help troubleshoot the blinking pattern on the LED status indicator next to the test button. Q. How soon can I get this? All orders placed before 12:00 PM EST will be processed & fulfilled the same day, orders placed after noon will be processed and fulfilled the following business day. This practice Is subject to stock availability on the requested product. UPS Ground service is 3 - 5 days not guaranteed from UPS. All other expedited services are guaranteed by UPS to be delivered as stated. Order will be fulfilled the same day for delivery the following day. Order will be processed and pushed to production for the item to be manufactured. Once the item is furnished, the order will ship via 2nd day air for delivery. We take it upon ourselves to ship the order from the closest warehouse that has the item in stock to the end destination for the customer. Please contact us for lead times on products to ensure proper delivery. We do not ship internationally with the exception of Canada. We are willing to ship to a freight forwarder of your choice within the United States and allow you to orchestrate the shipment with them there-after. We operate on EX-WORKS inco-terms for international orders. Once the goods leave our warehouse, we assume no liability for the goods should they get lost in transit by the freight forwarder as we have no control over their actions. For Canadian orders, we ship via UPS and broker through UPS. The shipping fee is not inclusive of tax & duty for importation of goods. Should any additional fees be required, they will be handled by UPS at time of delivery. Q. Do you offer terms? We only offer terms to the following organizations. We are otherwise a prepayment required company and accept any major credit card, checks, paypal, or wire transfers. Exceptions can be made on rare occasions.